Spring is in the air as my still-hibernating soul gives way to earlier morning light. Although chilly mornings remain, these longer days signal change for warmer days ahead and the abundance spring provides. Rob and I built nest boxes this weekend for our resident and migrating feathered friends, laying out the welcome mat to replace, at least in some small way, part of the habitat humanity has taken from them. Our old boxes were in need of updating as the entrance holes had been excavated by a crafty former resident and the elements had taken their toll. We built these boxes suitable for chickadees, wrens and/or tree swallows with an entrance hole size of an exacting 1 1/8″ in diameter: their preference. Cornell Lab showed us how. This specific hole size keeps out invasive/introduced species such as house sparrows and starlings who compete for nest sites, often violently, leaving the native songbird terribly injured, or worse, dead. Birds need all the mitigating support we can offer mostly due to habitat loss, those pesky invasive species we introduced long ago and a myriad of other human caused factors. I’ve plugged the entrance for now with a rock due to house sparrows already attempting to create a nest. I want to discourage them as long as possible. They should be well on their way at building at a different location when the songbirds are ready to start building, hopefully choosing our carefully built nest boxes to raise their broods. Of course with my watchful eyes on the lookout for those house sparrows. We’ll be offering our observations to Nest Watch so they can continue to study data gathered by citizen scientists in an effort to monitor songbird populations. It’s fun monitoring and watching too, especially if the nest is successful! Although I’ve an eye to spring, I’m still in the mood for cozy comfort food. This salad is a good seasonal transition. Still offering comfort, while satisfying the need for chilled nourishment. Because I know how much y’all love quinoa salads, I got busy developing a Southwestern style quinoa salad, full of spicy Mexican flavors. This Quinoa Mango Black Bean Salad with Smoky Pepitas and Chipotle Lime Vinaigrette is popular one on the blog, and it’s been too long since I shared a new quinoa salad. This mouthwatering, packed with Mexican flavors quinoa salad is simple enough to pull together too! While the sweet potatoes, jalapeño and pepitas are roasting, cook the quinoa, chop the spinach and onions. Rinse the black beans and gather the ingredients for the dressing. While the potatoes, pepetias and quinoa are cooling, add the roasted jalapeño to a food processor along with the olive oil, lime juice, garlic, cilantro and seasoning. Assemble the salad, pour on the dressing and stir in the avocado just before serving. This recipe makes a big salad. It’s a make-ahead salad, holding well for several days in the refrigerator, which means it’s ready when I need it #getinmybelly. 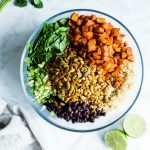 Suitable for lunch, picnics, potlucks or a light yet filling dinner, I find hearty salads like this help me stay full through the day and avoid afternoon snack attacks! If you’re sensitive to spicy things, the jalapeño is not very noticeable as long as you scrape out the seeds and ribs after roasting. It adds a mild mouth burn due to the balance of cooling ingredients such as lime and avocado. So be brave, be bold! Add that jalapeño! What spring projects are on your list? Preheat oven to 425F (218C). Line a sheet pan with a silpat or parchment paper. Place the jalapeño (for the dressing) on the sheet pan. Toss the cubed potatoes with 1 1/2 Tbs oil. Sprinkle 1/2 tsp chili powder, 1/2 tsp paprika, 1/4 tsp cumin, and 3/4 tsp salt over the top of the potatoes and stir well. Spread on prepared sheet pan with the jalapeño, in an even layer and bake for about 20-24 minutes or until fork tender. Turn the jalapeño once while roasting. Transfer the potatoes to a bowl and place in the refrigerator to cool. Set the jalapeño aside to cool. 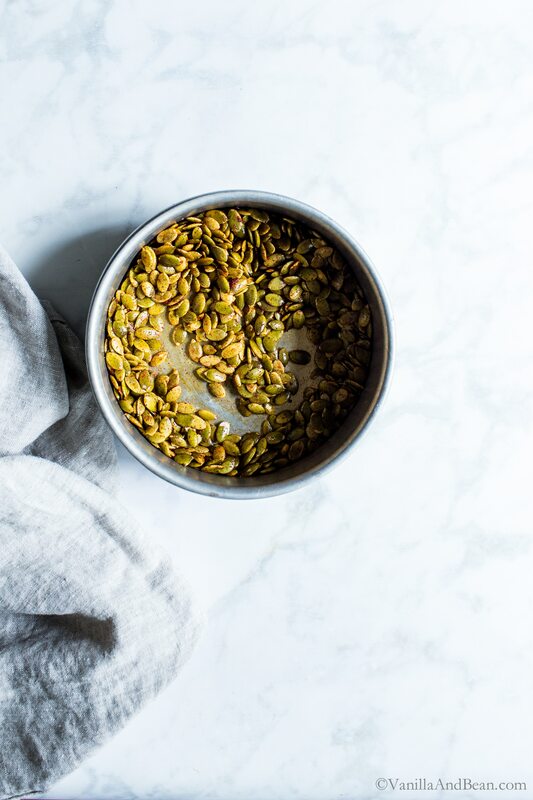 Toss pepitas with 1/2 tsp coconut oil, 1/8 tsp salt and 1/4 tsp + 1/8 tsp paprika. Toast the pepitas in the same oven as the potatoes and jalapeño for about 6-7 minutes. They will be slightly golden and fragrant when ready. Set aside to cool. While the potatoes, jalapeño and pepitas are roasting, cook the quinoa. In a small sauce pot, bring quinoa, water and salt to a boil, turn to low and simmer uncovered for 13-14 minutes. Remove from heat, stir, cover and let set for 5 minutes. The quinoa is ready when tender and with its 'tails' showing. Drain off any remaining water. Place in refrigerator to cool while the rest of the salad is being prepared. Slice the roasted jalapeño (see step 1 in "for the salad") in 1/2, lengthwise and scrape out the seeds. 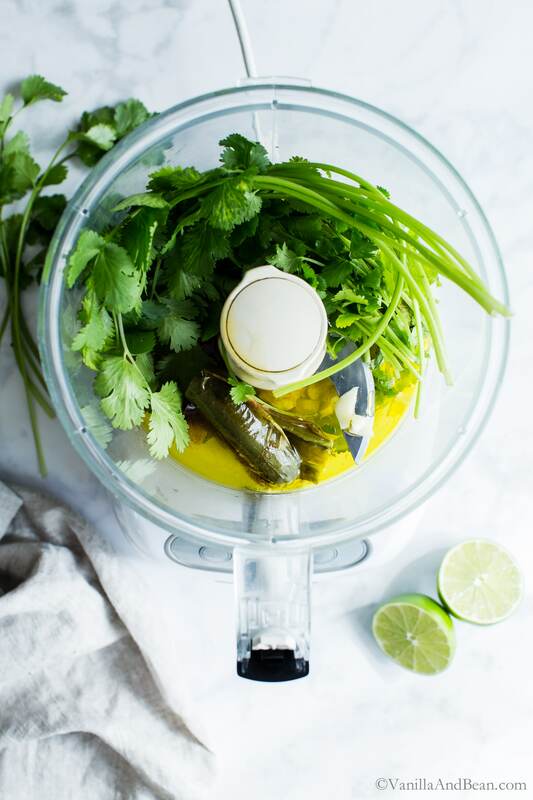 In the bowl of a food processor, add the jalapeño, lime juice, garlic, cumin, salt and cilantro. With the processor on, pour in the olive oil. Process until smooth. 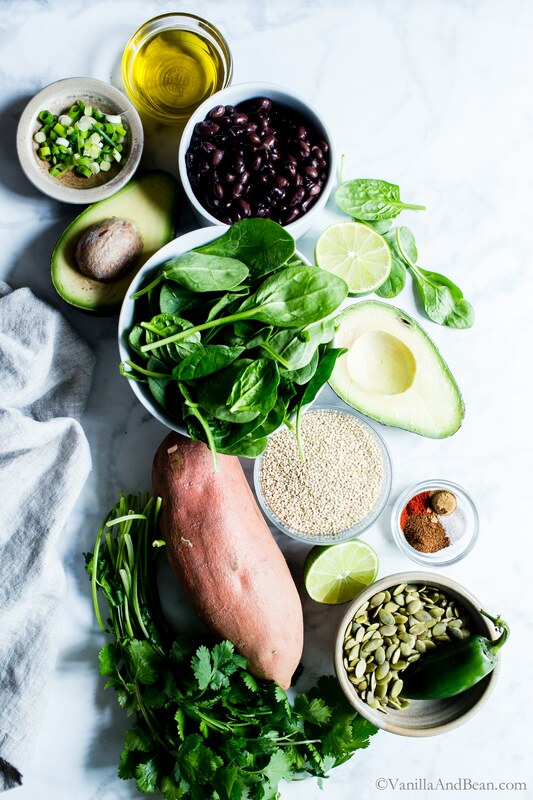 After the potatoes and quinoa have cooled, add them to a large mixing bowl along with the black beans, spinach, green onions, and pepitas. Drizzle 3/4 of the dressing over the salad and mix well. Taste to see if more dressing is desired and adjust as needed. Add a few twists of fresh ground pepper and adjust salt as needed. If time is available, dress the salad about an hour before service. The flavors will come together as it sets in the fridge. Just before serving, stir in diced avocado and chopped cilantro. Serve with lime wedges. Store in the refrigerator, in a lidded container for up to three days. I can’t wait to make this tonight! Couldn’t find raw peptitas at the store so I got the roasted and salted kind. I hope that substitution doesn’t mess with the flavors too much. Hi Colleen! I hope you enjoyed the recipe. The roasted and salted kind are fine so long as there was no additional salt added when given them a light roast with the smoky paprika. The salad was tempting. My family loved it. The way you add different ingredients with exact amount was just amazing. It adds flavors in it. Wow! 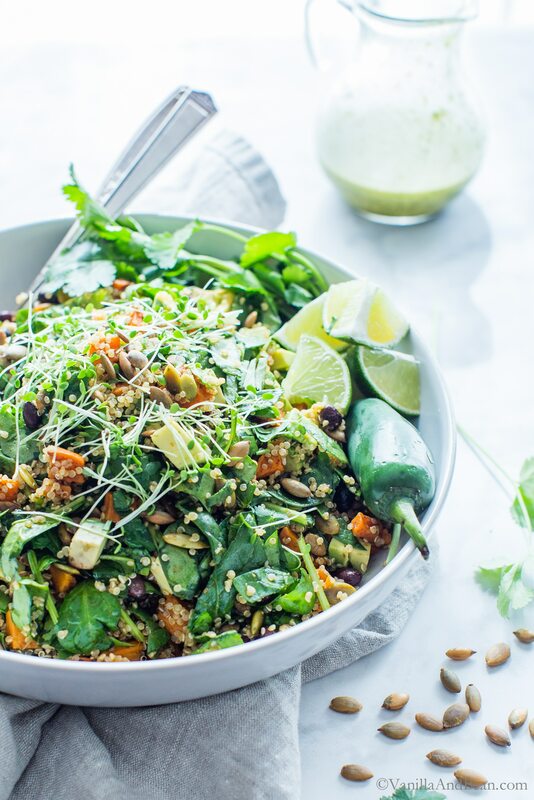 This is such a nutrient-dense salad recipe! Can’t wait to incorporate it into my diet! I hope you enjoy it Agness! Thank you Amisha! I tend to keep salads on the ready around here, so I’m always trying new flavors and textures. Dressings are most fun to play with, especially when it comes to roasted peppers! And the Chickadees are most interesting and beautiful birds. I’m grateful they chose our nest box so we could take a peek into their wild lives. Oh lord this salad was amazing! Even meat loving boyfriend praised it! Took us back to Mexico! Thanks! Hooray!! I’m so happy you and your meat loving boyfriend loved the salad, Isabella! (I’m curious if you went for two jalapeños?!) Thank you for sharing! This is exactly what my body needs right now after a chocolate filled day. How nice of you to make a home for birds. What a great activity to do with your spouse. We are planning to take on gardening as soon as the weather here in Vermont warms up. Though it seems like we still have a few more cold weeks ahead. I’m with ya, Aysegul… I’ve had this with two and it’s soo good. Next time I’ll try three! :D Hooray for spring gardening. I can’t wait to hear what you plant! Quinoa is such a go to for dinner in our house. Love this tasty rendition. Trying it soon! I remember seeing this on your stories and thinking it looked so good! It’s basically all of my favorite foods in one dish. So delicious! It’s so fun working on recipes then making them come to life, sharing with others on the blog! I’m with you too, Sarah… sweet potatoes and black beans? FTW! And I’m grateful for you too… for all that you do <3. Hehe… relaxing and quiet until the gun range fires up, tourist season begins (we get LOUD motorcycles – with radios blaring – down our street) and the jets from the Navy base fly over. The quiet seasons are SO nice though (yay fall + winter!). All the jalapeños for you, Chey! Thank you for your pin! I love that you’re monitoring the songbird populations! What a fabulous and important endeavor! I just adore this salad! I have discovered that salads that contain quinoa are some of my favorites! This is so bright and healthy – just perfect for spring! This salad is gorgeous! I’m obsessed- love those pepitas :) Pinning! This is my kind of salad! 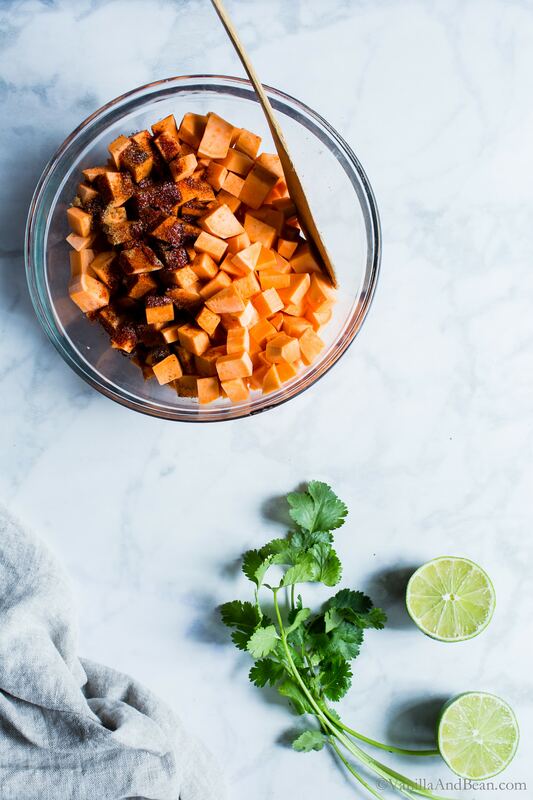 I love sweet potatoes, and that dressing sounds so good! I LOVE this, Traci! This is my kind of salad – healthy and fresh and flavorful – I could eat this for days. Love the dressing – I never make dressings like this and I should because it looks so yummy. Pinning this to share – just love it. Have a great weekend! This looks amazing Traci! and that dressing recipe! Definitely need to make that I love Jalapeno! This looks and sounds great, can hardly wait to try! Here in the Hudson Valley, Eastern Bluebirds, once endangered, are thriving again because of the kind humans who built them houses. They are a wonder to see, plentiful here now, it is a joy! Beautiful, post, as always, Traci! Awww you reminded me of building birdhouses with my Dad when I was little. Maybe I need to tackle that project again as an adult! Such a fun and easy way to help out our feathered friends. Love the spicy kick from the jalapeño. 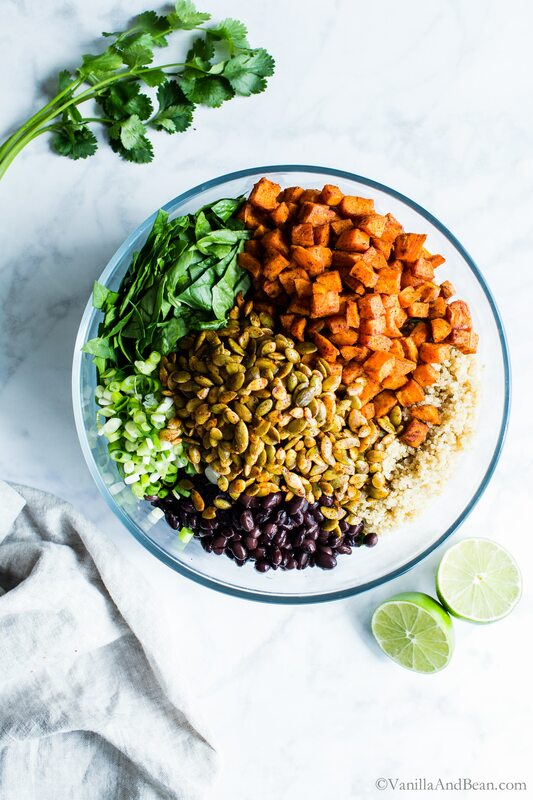 And this is such a great “transition” salad – hearty sweet potatoes with fresh greens. Perfect for this time of year. If you can believe it, we’re suppose to get 5-8 inches of snow this weekend. I wish that was an April Fool’s joke, but sadly it’s not. UGH! You did that when you were little? I love it Liz! Such a sweet gesture to help out our feathered friends. Indeed, Liz! They were so easy to build following Cornell’s instructions. OMG… whaaa (whaaa!! ), SNOW? That’s incredible! And you just made popsicles! LOL! First, I love how you and Rob built nest boxes for the birds!! I bet they’re so interesting to watch. I’m absolutely loving this salad Traci! 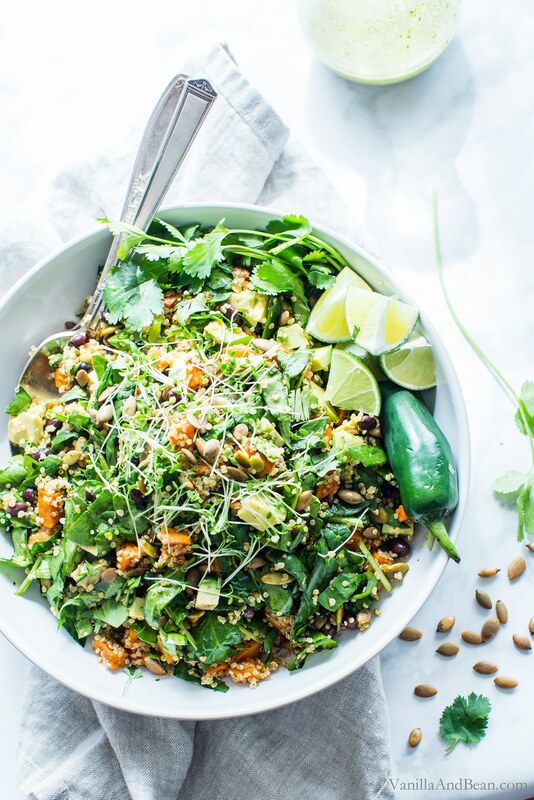 I love quinoa salads and the addition of the sweet potatoes and that wonderful roasted jalapeno lime dressing have me totally drooling. I would enjoy this for dinner and then leftovers for lunch for the rest of the week. I can’t wait to try. Thanks for sharing and happy weekend! 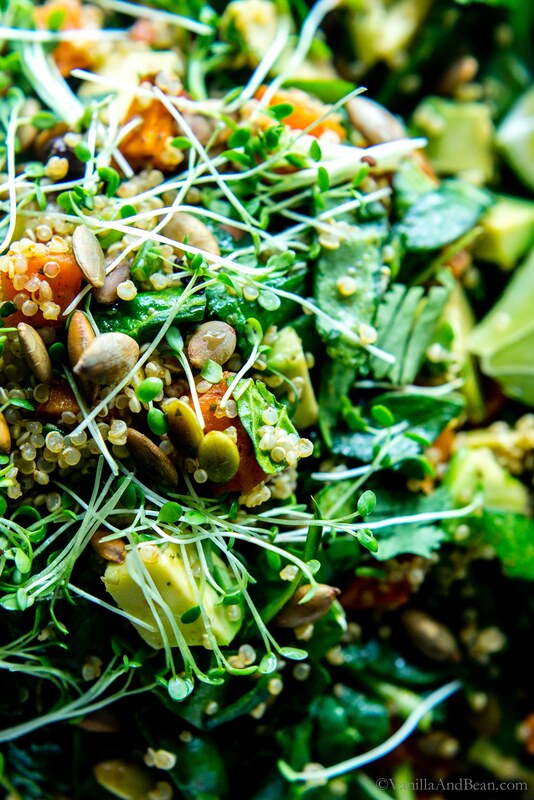 You photographs are stunning and this salad sounds delicious. My favorite recipes are always ones that you can make ahead that get better in the fridge after a day or two!